Reconstruction shapes a picture of a past event by piecing together evidence or acting out what might have taken place. In the field of historic preservation, a reconstruction portrays what a structure was "really like" when it originally existed. Reconstructions differ from other forms of historic preservation in that they are "built from scratch," with no existing structure to modify. The Apalachee Council House at Mission San Luis, shown here in 2011, is a dynamic example of reconstruction. One of the largest historic Indian structures in the Southeast, the Apalachee Council House was an important community center for both the Spanish and Native American inhabitants of Mission San Luis in the 17th Century. Often playing the role of "civic auditorium," it was capable of accommodating between 2,000 and 3,000 people. All of Mission San Luis was intentionally burnt down in 1704 so that there would be nothing left for the invading British to find. For hundreds of years, the only evidence of its existence lay hidden under the rolling hills of what we now know as Tallahassee. 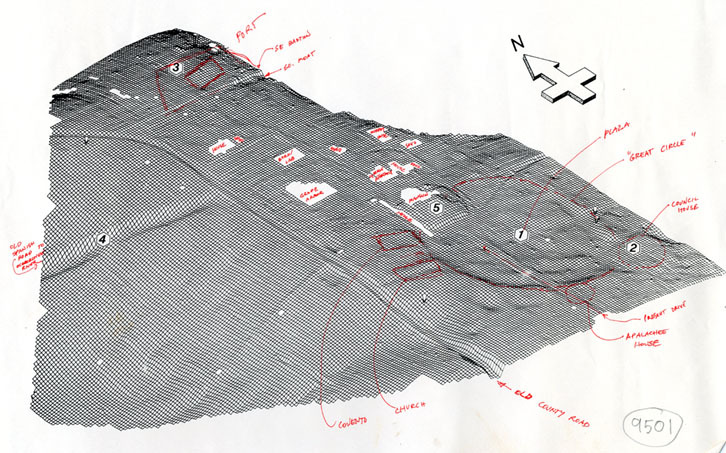 This topographic map of Mission San Luis helped archaeologists and historic preservationists locate and orient structures such as the Apalachee Council House. Archaeological excavations were conducted at the Council House in 1985. The data gathered from these excavations, combined with research conducted at similar sites, provided the basis for reconstructing the Council House. The symmetrical orientation of the Council House allowed archaeologists to approximate the location of postholes and other features based on those found in the archaeological record. The Council House was eventually reconstructed atop these units after they were filled in. When you visit Mission San Luis, take the opportunity to imagine all of the undiscovered artifacts that lie in the ground beneath your feet. These images illustrate the process of reconstruction from conception to completion. 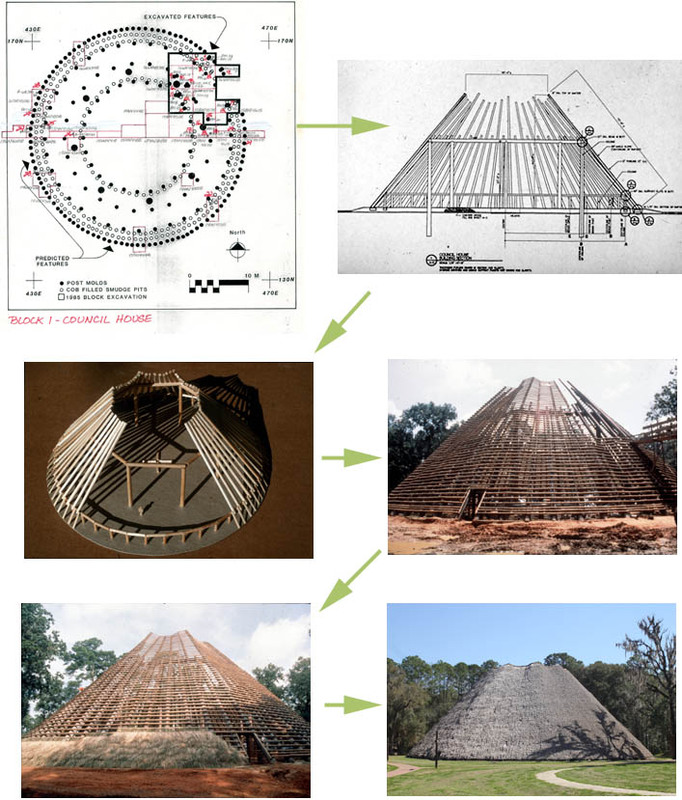 When the Apalachee constructed the original Council House in the 1600s, they did so without the aid of ladders, scaffolding or the largest crane in Florida. For Herschel Shepard's 1999 reconstruction project, this modern technology was instrumental in recreating the expansive structure. Would the reconstruction have been successful had modern building materials been unavailable? 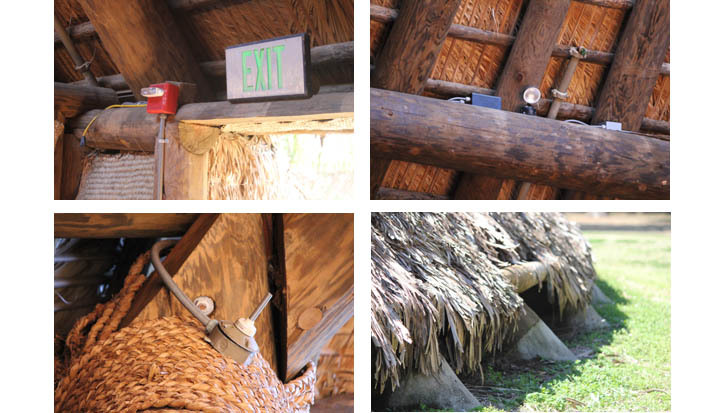 To meet modern construction standards, some compromises in authenticity were necessary. While pinewood was still used as the primary construction material, it was treated for waterproofing, a luxury the Apalachee never enjoyed. Great care was taken to discreetly integrate modern components into the Council House so that they would not detract from the visitor experience. How many examples of modern technology can you find in the reconstructed Council House?